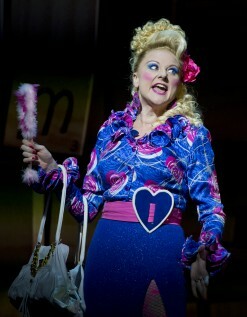 Marika Aubrey as Mrs Wormwood. Photo by James Morgan. Posted August 24, 2015 by Alannah Maher & filed under Arts & Entertainment, Theatre & Performance. Indeed, just about all of the characters in this adaption strike a perfect balance between comic and authentic; it could have been very easy to turn Dahl’s work into a caricature. James Millar stole the show on many occasions with his incarnation of the delightfully horrendous Miss Agatha Trunchbull, the extreme costume and mannerisms tapered with strong and subtle acting. The portrayal of Miss Honey in this production left something to be desired, however. While her hesitating sweetness was true to form, I found myself waiting for a certain gumption to kick in, but it was never truly realised. The international acclaim of this musical is a testament of how well it has done to escape the trappings of comparison. While many generations entered the theatre with Roald Dahl’s 1988 children’s novel imprinted in their minds, I was amongst the many who had formed a special childhood association with the 1996 film adaption. One stark point of contrast in this adaption is the presence of Matilda’s magical powers, or lack thereof. Instead of making the child protagonist’s telekinetic abilities a focal point from the get-go, the show focuses more on Matilda’s other abilities–her brilliant storytelling and astonishing academic abilities, her piercing wit and the devious pranks she plays on her neglectful parents. With a mesmerising combination of music, scripting and staging to play up these devices (including the brilliant unfolding of an unsuspectingly integral story Matilda tells to the librarian Mrs Phelps, incorporating circus costumes and shadow puppets), I was, honestly, hardly bothered by the lack of magic tricks. Perhaps in musical theatre it is difficult to portray the nonchalant wisdom I’ve come to expect of Matilda herself, but unlike the red-bow-sporting girl in the film, this Matilda comes across more like an outspoken Hermione Granger; not to discredit the captivating performance by the talented little girl taking the reins on the night I saw the show (which one she was of the four children undertaking the role for this production, I’m actually not quite sure). The talented child actors are a credit to this production, I often found myself enviously marvelling at how they flawlessly recounted their lines, belted out their songs and managed not to fall off the stage as they took to the swings during the excellently staged sequence for the tear-jerkingly lovely ‘When I Grow Up’. Classmates Bruce Bogtrotter and Matilda’s best friend Lavender were particularly special. Kelly’s script fits seamlessly with Tim Minchin’s music and lyrics. While many musicals can often feel laboured with their constant injections of musical routines, almost every song in this production surprised and delighted me with it’s accompanying staging and choreography. The foreboding ‘School Song’ performed to Matilda and her classmates by the older children on their first day of school was particularly impactful as they climbed and swung from the school gates. Tim Minchin has been widely praised for his input as composer and lyricist, his cheeky musical comedy an unlikely match to bring Roald Dahl’s classic story to life. It is perhaps Minchin’s tendency to “never show the light without the dark” that makes his lyrics the perfect match for Dahl’s work. She elaborated: “What’s important to remember is that all the grown ups are seen through our protagonist… the audience is taken on a journey of these characters but always through her eyes, and they’re very real to her.” Mrs Wormwood and her husband are really quite neglectful, abusive parents when you stop to analyse it–but Aubrey and co-star Daniel Frederikson do comedic justice to these larger-than-life characters. Fans of Minchin’s observational comedy will sense some familiarity in much of the lyrics, right from the opening number, ‘Miracle’. As spoilt ‘princes’, ‘princesses’ and their blindly doting parents paraded around the awesomely decorated stage, I was feeling a sense of déjà vu for Minchin’s hilarious yet cynical commentary of his ‘So Rockra. The more emotional songs brought recollections of his achingly beautiful not-quite-Christmas song ‘White Wine In The Sun’ to mind. Audiences should not expect to see a carbon copy of either the book or film on the stage, but rather a show that is its own beast: a modern testament to a story that celebrates the cleverness and wit of a remarkable young girl, with occasional subtle nods to the popular film. This is not a play specifically for children or adults; it has something for all age groups. Fans of Roald Dahl and Tim Minchin alike should be satisfied.